“Let the Women Keep Silent in the Churches” 1 Timothy 2:11-15 1 Corinthians 14:34-35. 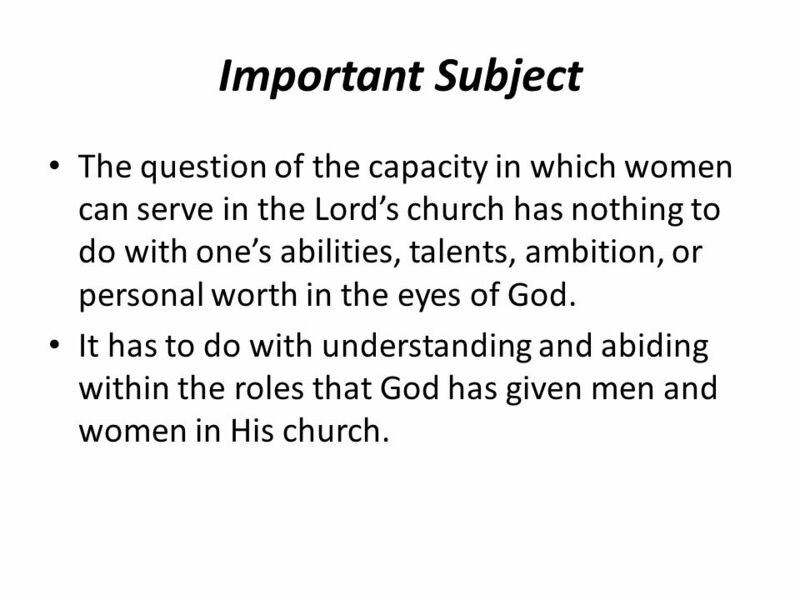 2 Important Subject The question of the capacity in which women can serve in the Lord’s church has nothing to do with one’s abilities, talents, ambition, or personal worth in the eyes of God. It has to do with understanding and abiding within the roles that God has given men and women in His church. 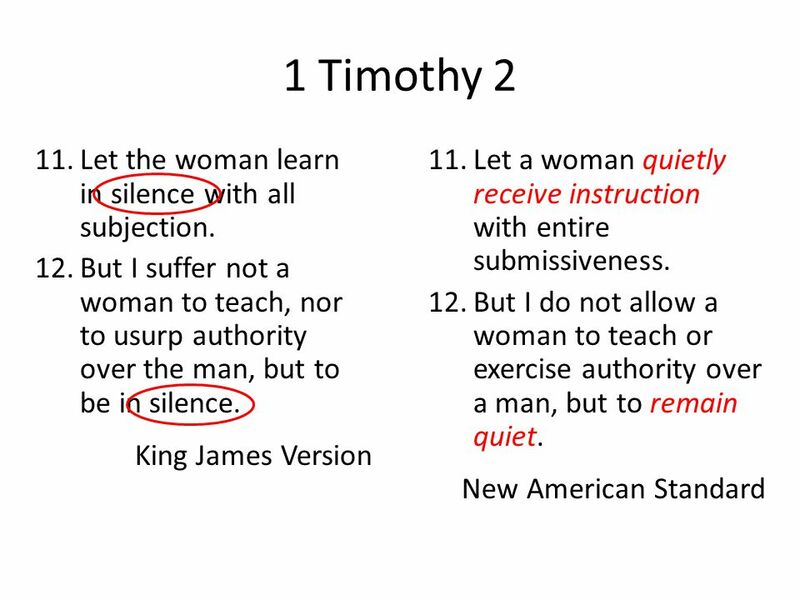 11 1 Timothy 2 11.Let the woman learn in silence with all subjection. 12.But I suffer not a woman to teach, nor to usurp authority over the man, but to be in silence. 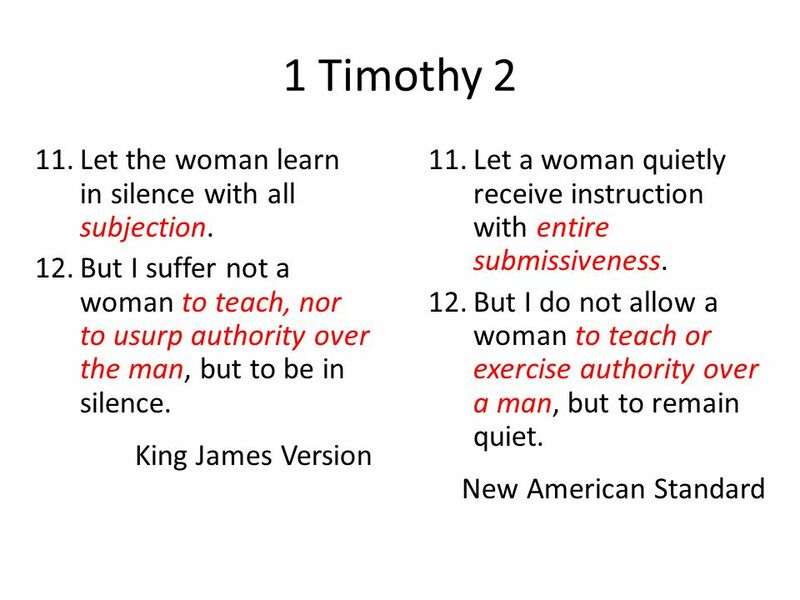 King James Version 11.Let a woman quietly receive instruction with entire submissiveness. 12.But I do not allow a woman to teach or exercise authority over a man, but to remain quiet. New American Standard A woman can sing, confess her faith, correct her children, etc., but she is not to assert herself and take on a role of authority or leadership over a man in the assembly of the church. 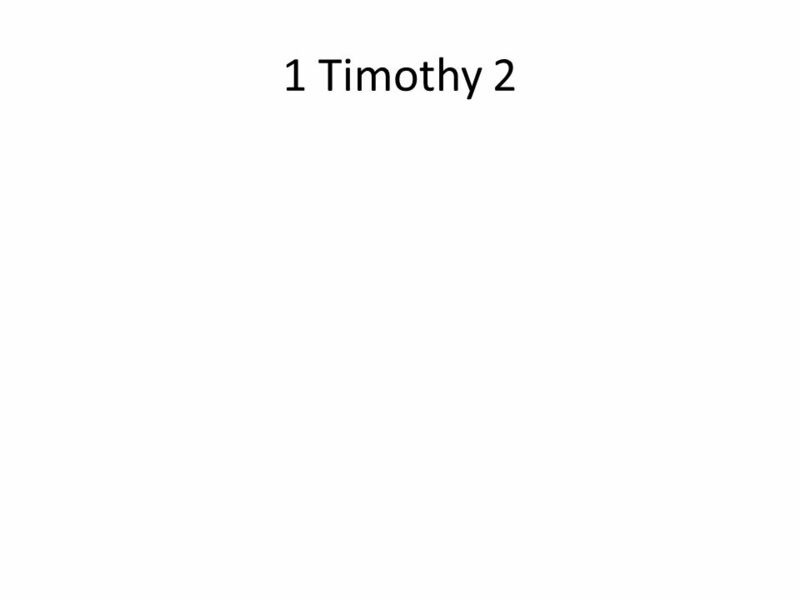 12 1 Timothy 2 13.For Adam was first formed, then Eve. 14.And Adam was not deceived, but the woman being deceived was in the transgression. 15.Notwithstanding she shall be saved in childbearing, if they continue in faith and charity and holiness with sobriety. The order of creation. When the woman took the leadership role, she was deceived and was placed under man’s authority (Gen. 3:16). 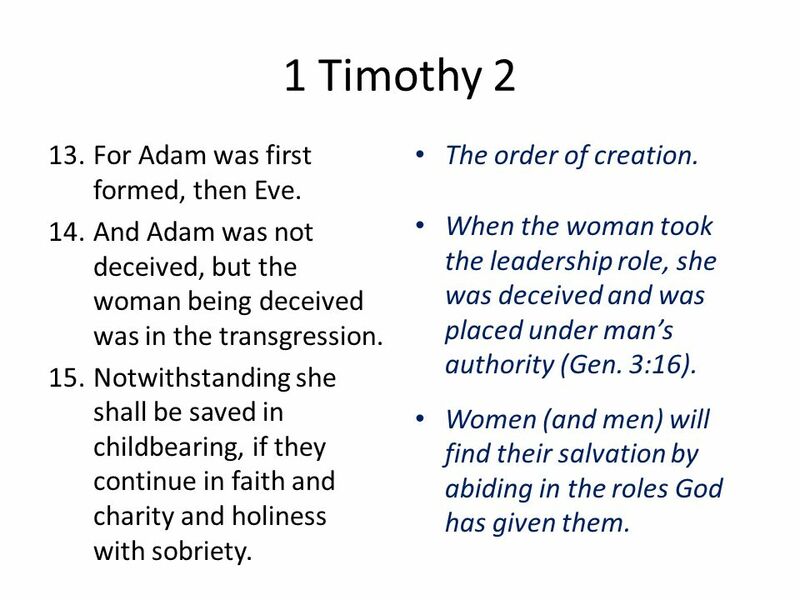 Women (and men) will find their salvation by abiding in the roles God has given them. 19 Context: Proper Behavior in Worship Service of the Local Church v. 26 – church has come together for worship. 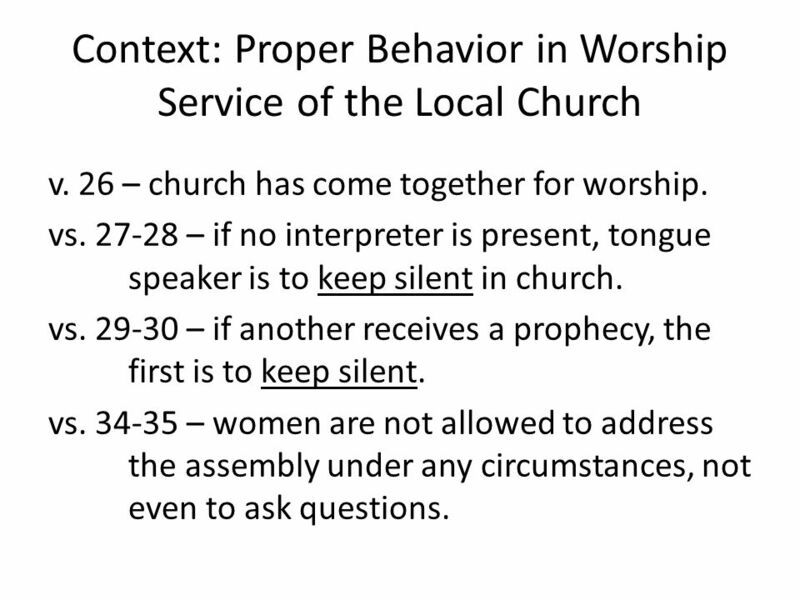 vs. 27-28 – if no interpreter is present, tongue speaker is to keep silent in church. vs. 29-30 – if another receives a prophecy, the first is to keep silent. vs. 34-35 – women are not allowed to address the assembly under any circumstances, not even to ask questions. 21 Applications Can women teach other women and children? – Yes, just not in the worship assembly. 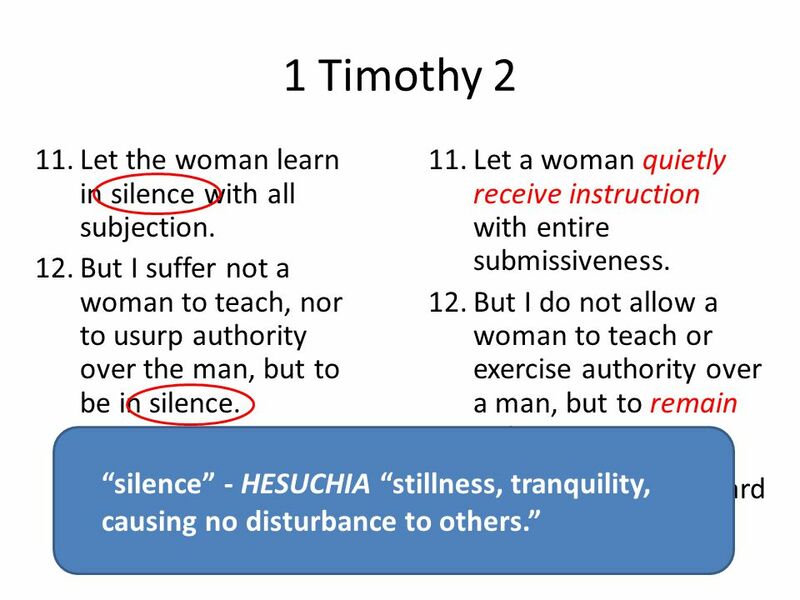 – Titus 2:3 Can women speak up in Bible Classes? – Yes, Bible Classes are separate from the worship assembly. 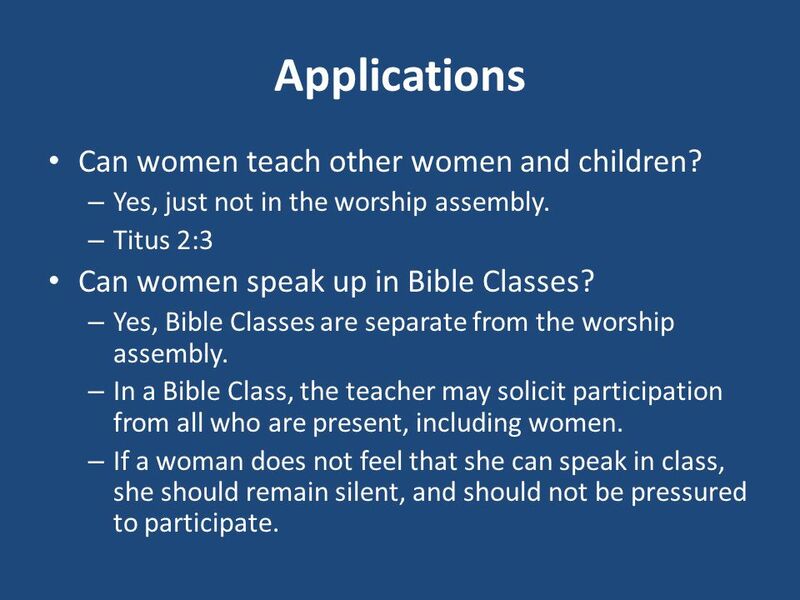 – In a Bible Class, the teacher may solicit participation from all who are present, including women. – If a woman does not feel that she can speak in class, she should remain silent, and should not be pressured to participate. 22 Women Play A Very Important Role in the Lord’s Church There would be no elders or deacons without women (their wives). Older women are to teach the younger. Women like Dorcas and Phoebe were very important to local churches. Women set good examples, help spread the gospel, and encourage others. Paul mentions several women by name as being good workers and helpers. 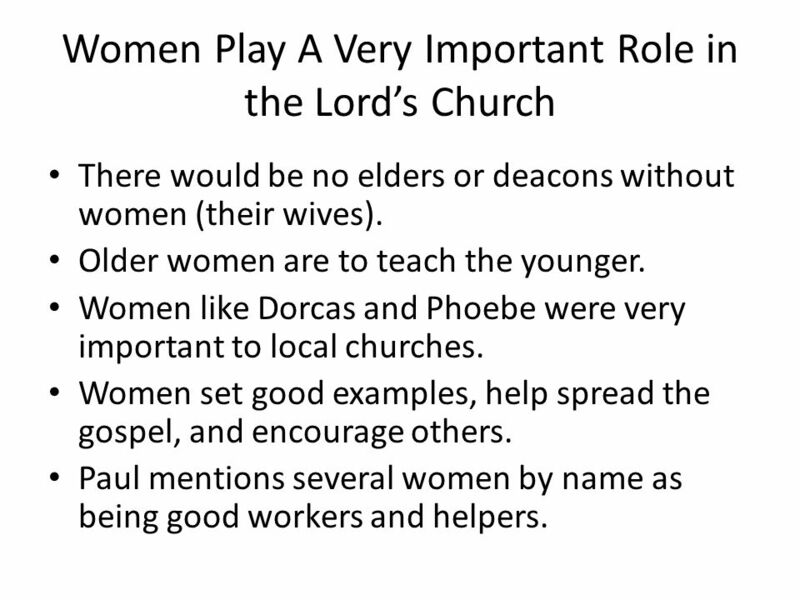 23 Women Play A Very Important Role in the Lord’s Church There would be no elders or deacons without women (their wives). Older women are to teach the younger. Women like Dorcas and Phoebe were very important to local churches. Women set good examples, help spread the gospel, and encourage others. Paul mentions several women by name as being good workers and helpers. The role of women in the local church is not settled by emotional appeals, denominational practices, changes in society, or the desire to use one’s talents. 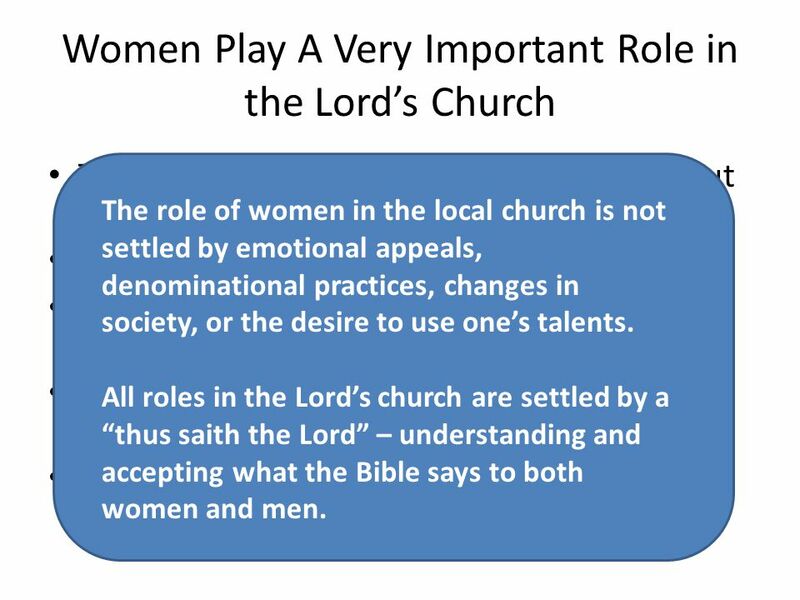 All roles in the Lord’s church are settled by a “thus saith the Lord” – understanding and accepting what the Bible says to both women and men. 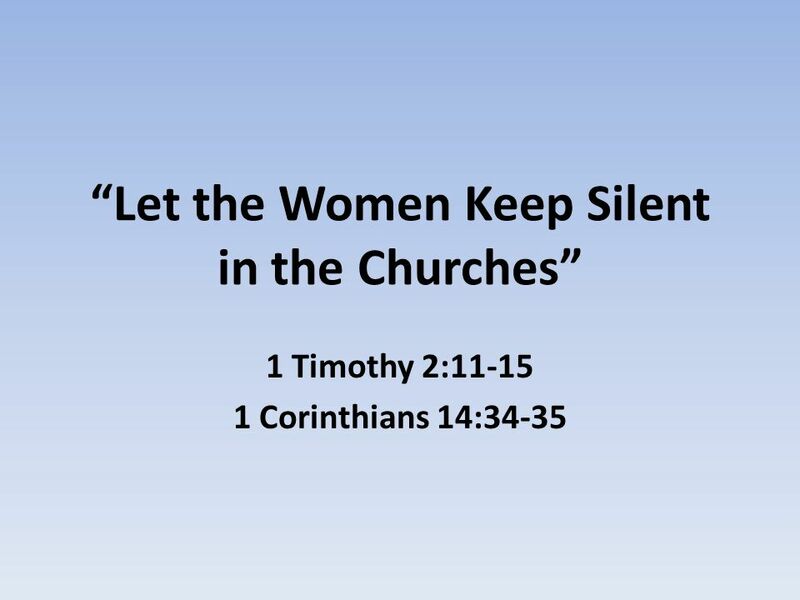 Download ppt "“Let the Women Keep Silent in the Churches” 1 Timothy 2:11-15 1 Corinthians 14:34-35." Why we do not have women preachers Why we do not have women preachers. Studies in Johns Gospel Chapter 12 And a vision appeared to Paul in the night: a man of Macedonia was standing there, urging him and saying, Come over. Paul wanted to visit local churches of Christ to encourage them (1 Thess. 2:17 – 3:13), but also to hold them accountable for their actions (2 Cor. 12:14. Galatians 3: Part 2 > The Bible and the role of women in the church A hotly debated, widely misunderstood topic To understand, must know what the. Saved to Serve Romans 6: Servants of Righteousness Romans 6:15-23… Servants of whom we obey, 6:16 We were once servants of sin, 6:17 Set free. “I have recently decided to sing on our Praise Team, which involves me being up on the stage. For a lifelong Church of Christ girl, this is a big leap! “The Needed Foundation” Ephesians 5:21. “The Needed Foundation” Ephesians 5:21 Ephesians 5:15-21. Lives Not Lips! 1 Timothy 2:9-15. It is easier to glorify the Lord with our lips than with our lives! 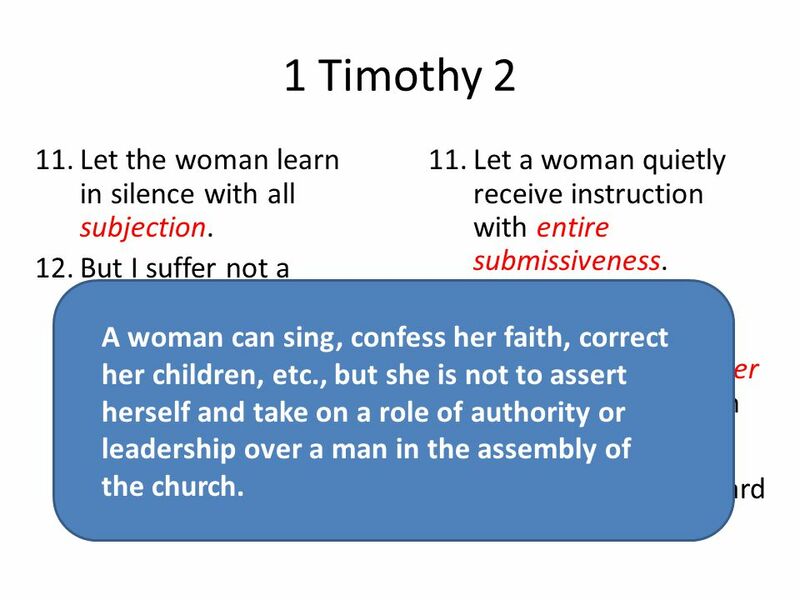 1 Timothy 2:8-15 What Does the Bible Say about Gender Roles? Lesson 03. 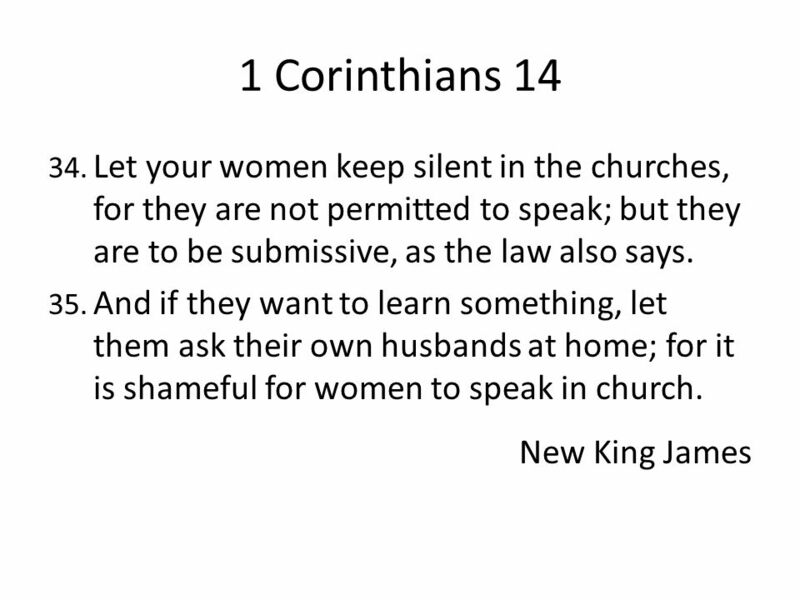 Women in the Church. Outline Old Testament Jesus, the Gospels Acts Paul, the letters 1 st Century Unity FXCC. Bible Question Box. 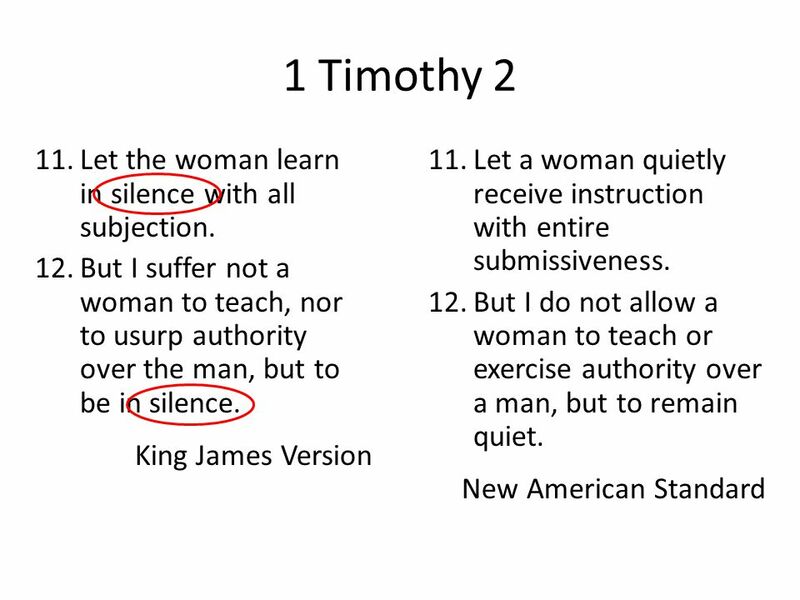 2 Two related questions 1)Can a woman say “amen” during a lesson? 2)What are the Scriptural reasons that a woman is not usually allowed. What is a Woman’s Work in the Church?. Women equally important Eph. 4:6 everyone works, equally important Rom. 16 Phoebe, Mary, others. Blah, Blah, Blah 1 Corinthians 14 1 Corinthians Pursue love, and earnestly desire the spiritual gifts, especially that you may prophesy. 2. Three Questions About The Assembly. Why is our building called “The Good News Center” or “The Gospel Hall”? Question 1: 2/34. “God Needs Godly Women In The Kingdom” Don McClain 1 W 65th St church of Christ / January 13, 2008. 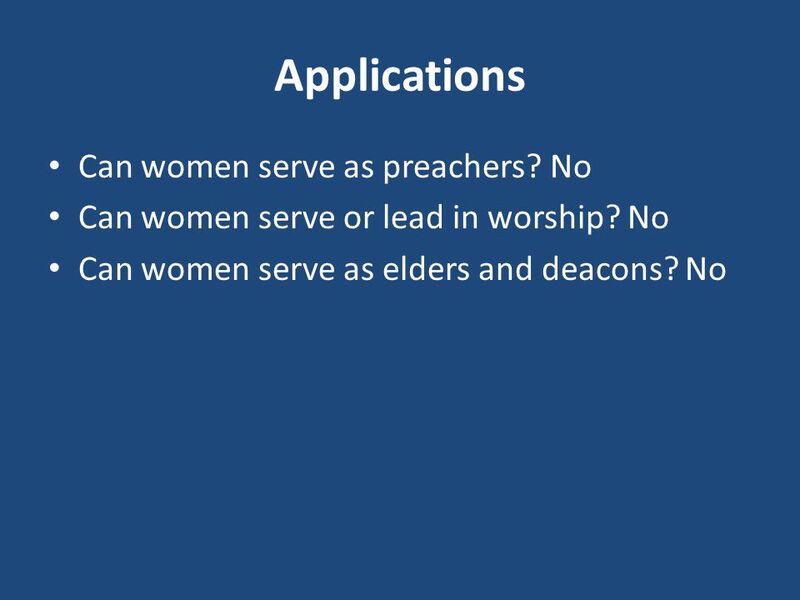 Women Serving Cannot do what God authorized Anything a man can do: preach, elder, lead singing, etc. 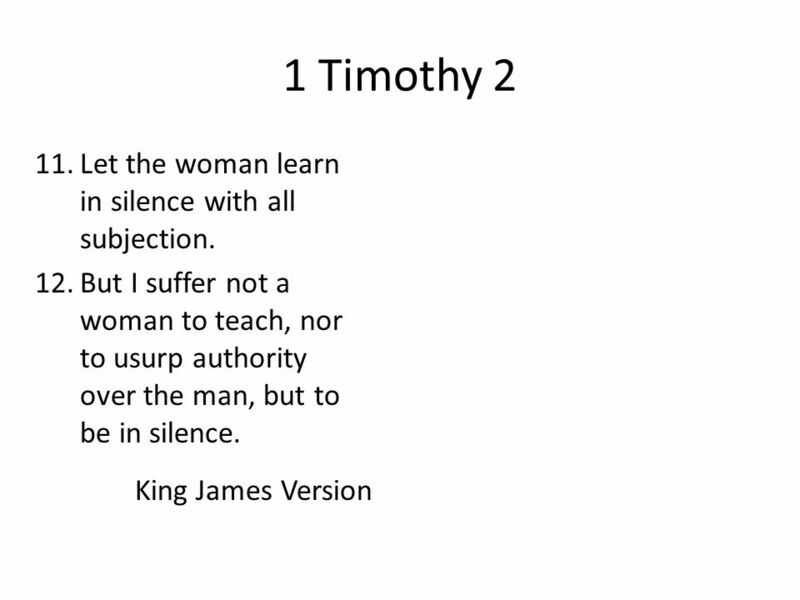 Valuing Women in the New Testament… Titus 2:3-5. Valuing Women Does not Diminish because of AGE – older women training younger women (Titus 2:4) – Manifesting. Divine Order New Testament. Man’s Role: headship Gen 3:16 Gen 3:16 – “rule” 1 Cor 11:3 1 Cor 11:3 – “head” Eph 5:23-25 Eph 5:23-25 – “head” Eph 6:4 Eph.